For the remainder of the day in Cannes, I took a bus tour around the island, and saw the giant theatre that was part of the Cannes film festival. The bus passed by beautiful homes, apartment buildings, and hotels, which catrered to the rich and famous on the island. Cannes wasn't that interesting-truth be told. But that was ok, since the yacht was in port every single day-it was nice to return to the ship early, and catch some rest. And being Cinco De Mayo, there was a half price margarita day on deck, with a spread of chips with salsa, guacomole, etc. I met my friend there, and enjoyed many chips and a few margaritas. The musical duo played some Mexican tunes. After a few hours of drining and snacks in the late afternoon, it was time for a nap, which I did-and then the big barbecue. Being this was early May-the weather on this cruise was iffy. (mostly sort of chilly-which is probably why this cruise wasn't very expensive). 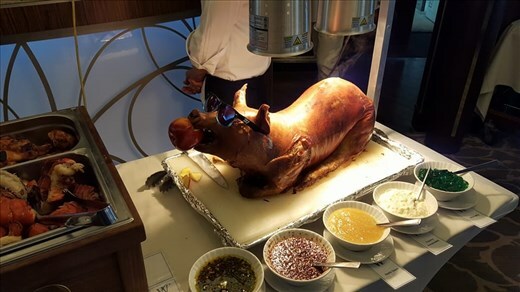 So in short, rather than the barbecue on deck, it was served in the dining room buffet-style. And what a buffet it was, there we're steaks, a pig with an apple in it's mouth, and all sorts of crackers, cheeses, potatoes, I could go on and on. there we're deserts galore. It was a glorious spectacle of food, including the food we saw Chef Jeff buy from the market that morning. A gigantic buffet of food. I usually don't eat meat-but he meat which was being carved looked so delicious I ate it. And the cheeses....All the delicious cheeses from the morning we're served. I ate lots and lots of that tangy delicious cheese. I didn't have any of the scruptious cakes or pies for desert. I had cheese. This reminds me of a story I heard from the Bacchanalias from ancient times. One of the "tools of the trade" for these giagantic parties was a giant stick-for the sole purpose for partiers sticking down their throat-to throw up-so they can eat more food. (No, I didn't do that). But I saw the temptation.